Scareware is deception software. It is also known as "rogue scanner" software or "fraudware," the purpose of which is to frighten people into purchasing and installing it. Just like any trojan software, scareware deceives unwitting users into double-clicking and installing the product. 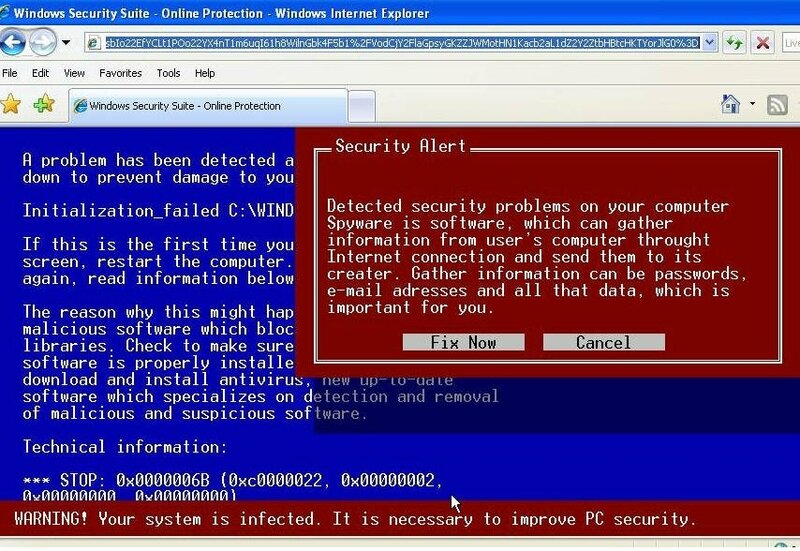 In the case of scareware, the scam tactic is to display frightening screens of your computer being attacked, and then the scareware will make claims to be the antivirus solution to those attacks. Scareware and rogue scanners have become a multimillion-dollar scam business, and thousands of users fall for this online scam every month. Preying on people's fear and lack of technical knowledge, scareware products will bilk a person for $19.95, just by displaying a bogus screen of a virus attack. What Exactly Does a Scareware Screen Look Like? Scareware scammers use fake versions of virus alerts and other system problem messages. These fake screens are often very convincing and will fool 80% of the users who seem them. This webpage is another scareware example where a site pretends to be your Windows Explorer screen. What Are Example Scareware Products I Should Watch For? The following links are examples of scareware products that you should be on the lookout for. Note: it is safe to click these links for explanations of each. Accessing your credit card: Scareware will deceive you into paying money for fake antivirus software. Identity theft: Scareware will surreptitiously invade your computer and attempt to record your keystrokes and banking/personal information. "Zombie" your computer: Scareware will attempt to take remote control of your machine to serve as a spam-sending zombie robot. How Do I Defend Against Scareware? Defending against any online scam or con game is about being skeptical and vigilant: always question any offer, paid or free, whenever a window appears and says you should download and install something. Use only a legitimate antivirus/antispyware product that you trust. Read email in plain text. Avoiding HTML email is not cosmetically pleasing with the all the graphics taken out, but the spartan appearance circumvents fraudware by displaying the suspicious HTML links. Never open file attachments from strangers, or anyone offering software services. Distrust any email offer that includes attachments: these emails are nearly always scams, and you should immediately delete these messages before they infect your computer. Be skeptical of any online offers, and be ready to close your browser immediately. If the web page you have found gives you any sense of alarm, pressing ALT-F4 on your keyboard will shut down your browser and stop any scareware from getting downloaded. What Exactly Is Spamming 'Ratware'? How Does Ratware Work? What Exactly Is an Internet 'Mashup'? Do You Know What a Web Browser Actually Is?